Although it could be argued that each epoch in the modern era is regarded by its contemporary as a time of crisis, the present moment seems to offer in this respect certain particular traits in terms of the quality, intensity and spread of its crisis. Among its various dimensions, two seem distinctively salient: one is moral, the other cognitive. On the one hand, unlike either a purely economic or political crisis, the moral crisis is characterized by the fact that the moral beliefs and convictions of the population differ to such a degree that the consent necessary for action and reform is no longer given. On the other hand, unlike in the normal development of knowledge and science, which depends on critical thinking, critique is itself challenged and destabilized both externally by the contestation of its legitimacy and internally as it cannot rely any more on some shared norms and cannot claim an impartial standpoint from which it could be constructed. In sum, both trust and truth are at stake, as has been revealed by a series of recent events and controversies that have occurred internationally. 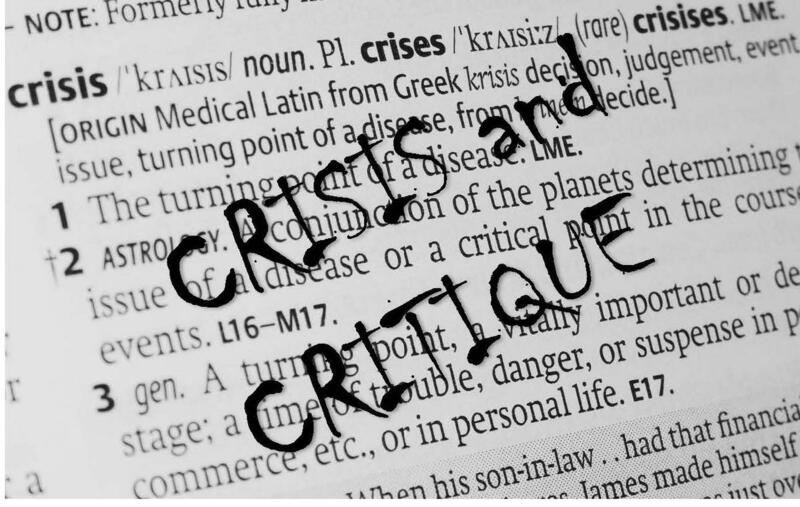 Reversing the title of Reinhart Koselleck’s famous inquiry into “the pathogenesis of modern society”, we thus want to address the multiple aspects of the complex relationships between crisis and critique, their roots, their current tensions, their potential openings. Such an exploration should bring together the various disciplines of the social sciences and humanities, including history, sociology, anthropology, law, economics, psychology, philosophy, political science, and literary studies. It supposes to examine the issues raised within diverse national contexts and from diverse intellectual perspectives, and therefore to convene scholars from different regions and traditions at a global level. It needs to be attentive to public debates and social movements which question the present crisis and attempt to invent new forms of critical practice. It implies a fruitful dialogue between empirical studies, based notably on ethnographic, archival and statistical work, and theoretical approaches, whether normative or interpretive, so as to comprehend the current social constellation, analyze its special conditions and rethink the potentialities of critique. The theme year will be led jointly by Didier Fassin, James D. Wolfensohn Professor in the School, and Distinguished Visiting Professor Axel Honneth, Jack C. Weinstein Professor for the Humanities in the Department of Philosophy at Columbia University.